Fiesta Resort All Inclusive is a modern, full-amenity, all-inclusive resort hotel perfectly situated along a beautiful beach outside the port city of Puntarenas. Set at the foot of a lush green hillside, only 50 minutes from the capital of San Jose, this all-inclusive beach resort is the perfect base for day trips across the country. Relax in contemporary accommodations offering array of amenities to make you feel at home. 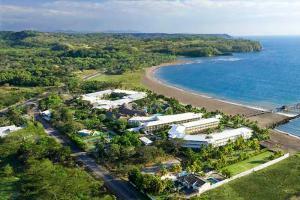 Located in Puntarenas, approximately 50 minutes west of San Jose airport. Arenal Volcano & Tabacon Hot Springs, Carara Biological Reserve, Golf Los Suenos, Manuel Antonio National Park, Marinas Los Suenos, Monteverde Cloud Forest, Poas Volcano, Tortuga Island.